Wear Rivers Trust and the Environment Agency have worked together to construct a new fish pass on Brancepeth Beck in County Durham. 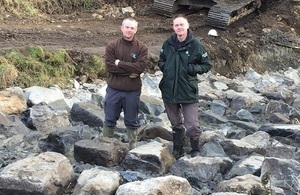 Wear Rivers Trust's Steve Hudson (L) and Paul Frear from the Environment Agency (R) at Brancepeth Beck. A new fish pass on a County Durham beck is giving fish access to an additional 6km of habitat. 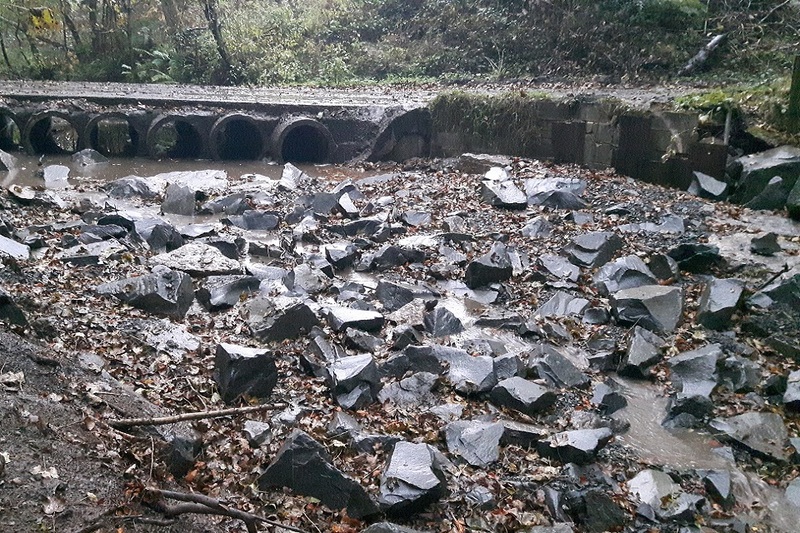 The new rock ramp fish pass at Goodwell Ford in Brancepeth Beck is the latest in a number of fish passage improvements along the beck carried out over the past three years. It’s hoped that these improvements will increase fish numbers across the whole river catchment. Habitat upstream of this previously impassable structure used to be almost completely devoid of fish but will now act as a nursery for juveniles as adult fish reach their natural spawning grounds. It’s the latest in a series of improvements to fish passage on the beck. Wear Rivers Trust have been working in partnership with Brancepeth Castle, Brancepeth Estate and Brancepeth Castle Golf Club on a project funded by the Environment Agency to modify structures such as culverts, weirs and bridge aprons which were proving to be obstacles to the movement of fish. The project is already reaping rewards as it was announced last year that fish had been seen moving freely up the beck for the first time in over 150 years once a 3m high weir had been modified. The size and density of the structures along this beck made the project particularly challenging but we have had great support from local landowners and volunteers to enable us to deliver some great improvements. Now most of the fish passage works are complete, it is great to hear about fish returning to previously inaccessible parts of the beck and we are very much looking forward to continuing the hard work with the help of our dedicated volunteers. Goodwell Ford is the sixth structure to be improved following support by volunteers to identify barriers on the beck. Two remaining structures will be monitored with a view to work being carried out in the future. We’ve worked closely with partners to enable Wear Rivers Trust to carry out lots of positive work in this area to look at structures and issues impacting on fish migration. This new fish pass opens up another 6km of watercourse for fish and make it far easier for them to travel upstream. The whole project is already reaping rewards. We’ve worked really hard together with our partners over the years to make dramatic improvements to water quality. But there is always more we can do and projects such as this at Brancepeth is an example of the sort of work taking place across the region to enhance our rivers and streams.